FLOWER BRIS PILLOW - Judaica Unlimited - Judaica Web store, to shop everyday Judaica needs including Jewish Articles, Shabbat items, jewish holidays, jewish celebrations. This beautiful white bris pillow features a satin look with a stunning lace trim. Embroidered with a choice of blue and silver or gold and silver threads, flowers decorate each corner. The words 'Eliyahu Hanavi Malach Habris', Elija the prophet - Angel of the Bris, is embroidered in an arc. 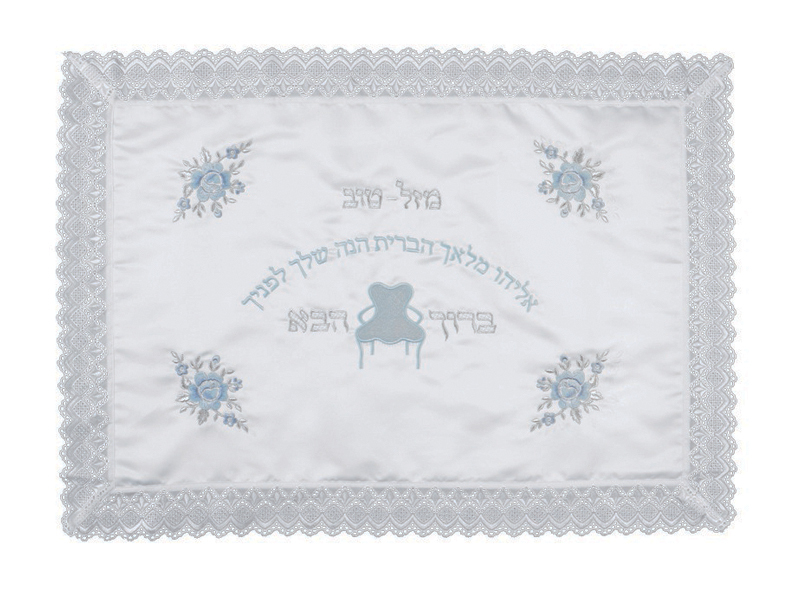 In addition, the words 'Mazal Tov' and 'Baruch Haba', are embroidered. At a brit milah the baby is laid upon this pillow and brought into the room. He is held by a sandek, an honorary person who holds the baby throughout the bris milah ceremony.